Our guest today is Gayle Hunt, President & Founder of the Central Oregon Wild Horse Coalition (COWHC), established as a non-profit organization in 2002. Ochoco Wild and Free Roaming Herd Management Plan, and sent a Scoping Letter to the public that is vague and doesn’t state the proposed Appropriate Management Level (AML), the number of wild horses and burros that will be allowed to remain on this HMA. (The current AML is 55-65 wild horses – not allowing a high enough number to be viable ). 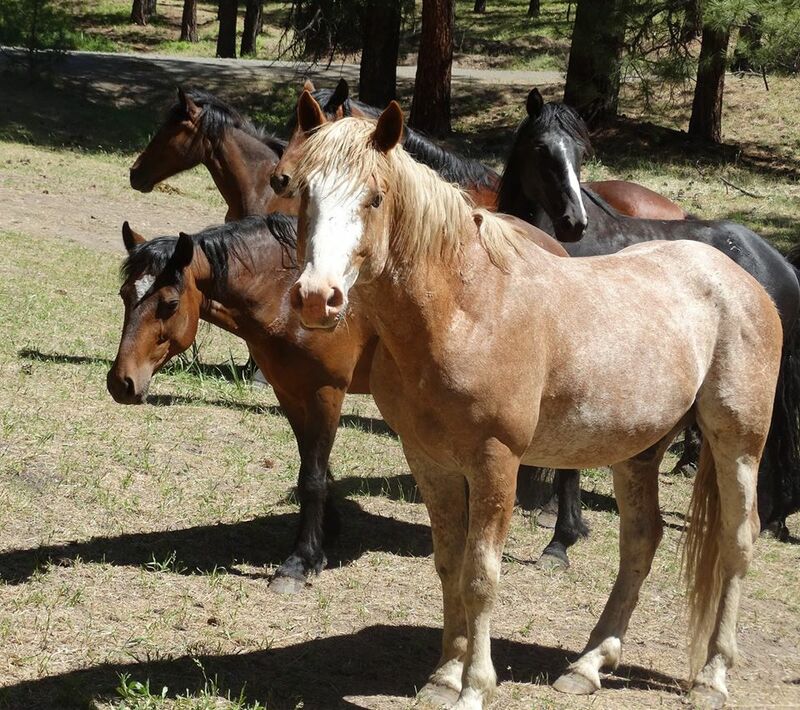 We’re asking YOU help save these horses and send in comments to the Forest Service requesting the AML be set at a viable herd number. In order to have a viable herd number, the Forest Service needs to set an AML of a minimum of 150-200 horses, including 50 breeding age adults. Also, please ask for a genetically sustainable herd. The Forest Service is doing genetic augmentation, so ask them to provide the public with all research and documentation for genetic augmentation, since their management decisions have included this. On this show you’ll learn more about how COWHC is currently trying to preserve the current 130 or so wild horses currently on the Big Summit HMA, about 30 miles east of Prineville, Oregon. Check out the COWHC facebook page HERE for the latest updates. COWHC is boots on the ground and provides one of the most accurate herd inventories in the nation, annually bringing a cadre of about 80 volunteers to count these wild horses on their turf. They also work on on-the-ground improvements like water developments, forage improvements, fence removal and other projects. to BLM_NV_East_Pershing_Complex_EA@blm.gov with “East Pershing Complex Gather” in the subject line. Questions and written comments should be directed to: Samantha Gooch, Wild Horse and Burro Specialist, BLM Humboldt River Field Office, 5100 E. Winnemucca Blvd., Winnemucca, NV 89445. Commenters should be aware before including their address, phone number, email address, or other personal identifying information in their comment, that their entire comment – including identifying information – may be made publicly available at any time. While they can ask BLM in their comment to withhold personal identifying information from public review, BLM cannot guarantee that it will be able to do so. Anonymity is not allowed for submissions from organizations or businesses and from individuals identifying themselves as representatives or officials of organizations or businesses. This show will be hosted by Debbie Coffey, V.P. and Dir. of Wild Horse Affairs for Wild Horse Freedom Federation. 1/8/17 – Carol Walker, Dir. of Field Documentation for Wild Horse Freedom Federation on BLM’s dangerous Radio Collar Study on the Adobe Town wild horses in Wyoming. Listen HERE. 2/15/17 – Marjorie Farabee, Dir. of Wild Burro Affairs for Wild Horse Freedom Federation and donkey advocate David Duncan (Donkey Rescue World), talk about the killing of the world’s donkeys for ejiao. Listen HERE. 3/8/17 – Marjorie Farabee, Dir. of Wild Burro Affairs for Wild Horse Freedom Federation and Australian donkey advocate Andrea Jenkins, a member of Good Samaritan Donkey Sanctuary, on the ejiao issue in Australia. Listen HERE. 4/12/17 – Dawn Vincent, Head of Communications for The Donkey Sanctuary UK, and Marjorie Farabee, Dir. of Wild Burro Affairs for Wild Horse Freedom Federation. In January 2017, The Donkey Sanctuary (UK) issued a report titled “Under the Skin,” about the global demand for donkey skins used to produce a traditional Chinese medicine (TCM) called ejiao. Listen HERE. 5/24/17 – ELAINE NASH, Founder and Dir. of Fleet of Angels, and Palomino Armstrong, founder of CHILLY PEPPER – MIRACLE MUSTANG, on the logistics of the rescue of the ISPMB horses and about the many wild horses that still need to be adopted. Listen HERE. 6/14/27 – Nancy Turner, Pres. of This Old Horse, a Minnesota nonprofit organization whose mission is to provide sanctuary to retired, rescued, and recovering horses, and Elaine Nash, Founder and Dir. of Fleet of Angels, a not-for-profit organization offering crisis management and transportation assistance during equine-related emergencies, talk about the ISPMB horses that still need to be adopted. Listen HERE. 6/21/17 – Bonnie Gestring, Northwest Circuit Rider for Earthworks, on contamination of U.S. waters in perpetuity, caused by mining. Bonnie is co-author of the report Polluting the Future: How mining companies are polluting our nation’s waters in perpetuity. Listen HERE. 6/28/17 – Neda DeMayo, Founder and President, and Cory Golden, Advocacy & Communications Director, of Return to Freedom, on the need for ALL of us to urge Congress to stand against a presidential budget proposal that threatens the lives of tens of thousands of horses. Listen HERE. 7/8/17 – Ginger Kathrens, Founder and Exec. Dir. of The Cloud Foundation, John Holland, Pres. of Equine Welfare Alliance, Katlin Kraska, Equine Lobbyist for ASPCA, Cory Golden, Advocacy Coordinator for Return to Freedom, and R.T. Fitch, Pres. of Wild Horse Freedom Federation, on how to help save wild horses & burros from eminent danger of slaughter as outlined in the 2018 Budget. Listen HERE.